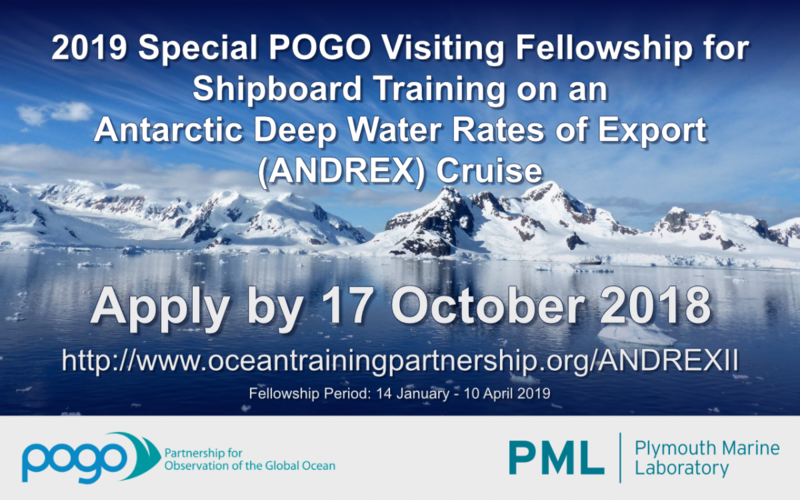 Partnership for Observation of the Global Ocean (POGO) announces a special Fellowship for on-board training on an Antarctic Deep Water Rates of Export (ANDREX) Cruise in partnership with Plymouth Marine Laboratory (PML) in the UK. One berth has been reserved on the next ANDREX cruise (ANDREX II) for the selected candidate. The programme is designed to promote training and capacity building leading towards a global observation scheme for the oceans. The ocean has absorbed a quarter of anthropogenic CO2 since the industrial revolution. The Southern Ocean is an area of deep water formation and thereby Carbon transport to the Ocean interior. The Antarctic Deep Water Rates of Export (ANDREX) cruise section (Figure 1) is part of the international effort to quantify this Carbon sink. The section encompasses the Antarctic Circumpolar Current (ACC) to the north and Weddell Sea to the south where deep water formation and Carbon sequestration take place. By quantifying the hydrography, age of water masses and their carbonate system we aim to quantify this transport under the UK Ocean Regulation of Climate by Heat and Carbon Sequestration and Transports (ORCHESTRA) programme (https://www.bas.ac.uk/project/orchestra/). The ANDREX section is a repeat-hydrographic section, previously occupied in 2009/10 and approximately under the WOCE S4A section in 1996 (https://www.nodc.noaa.gov/woce/). Such repeat observations allow us to constrain changes in anthropogenic Carbon and heat export over time. The ANDREXII cruise will start and finish in the Falkland Islands and will take place on-board the RRS James Clark Ross (https://www.bas.ac.uk/polar-operations/sites-and-facilities/facility/rrs-james-clark-ross/) with a team of scientists from the British Antarctic Survey (BAS), Plymouth Marine Laboratory (PML) and National Oceanography Centre, Southampton (NOC). The POGO fellow will assist with carbonate chemistry (Dissolved Inorganic Carbon, pH, pCO2) and Oxygen sampling and measurements. Total period of Fellowship: 14th January to 10th April 2019. Candidates should be available to participate for the full period. The applicant needs to e-mail the PIs listed above with a short CV and a statement of interest outlining their current research and what they hope to gain from the training. This fellowship would suit a candidate with an environmental science or analytical interest/background. Based on the information submitted by the applicant, the PI will decide if their profile is suitable for the project, and if so will issue an acceptance letter. Important note: the prospective supervisor should be contacted as soon as possible, and no later than 10 October 2018, to allow sufficient time for the supervisor to consider the application before the submission deadline. Applications and recommendation letters should be written in English and letters submitted/uploaded in pdf format. It is recommended that descriptive sections be limited to about 100 - 150 words. Please use font sizes of 10 pt or larger. Only applications that are complete in all respects will be considered for the Fellowship. Deadline: The deadline for applications for the 2019 fellowship is 17 October 2018. All applicants will be informed of the decision within one month of the deadline. The fellowship will provide the costs of a round-trip ticket between the home institute of the trainee and Plymouth; subsistence allowance for up to 1 month’s stay in the UK depending on the particulars of the proposed training (at a rate of 1035 EUR per month); the flight to and from the Falkland Islands; accommodation in UK; accommodation in the Falkland Islands; ship messing fee; seafaring medical and sea survival course. The trainee and the supervisors at the parent and host institutes are required to provide a short progress report at the end of the training period, to evaluate the success of the fellowship programme.